Continuing to bolster its position in the domestic market as the leading assembler and seller of commercial vehicles and trucks, Isuzu Philippines Corporation (IPC) has put on display the products that define the Isuzu brand’s key strength. Now arrayed at the 2016 Isuzu Truck Fest, which runs from April 14 to 16, 2016 at the SMX Convention Center in Pasay City, are the company’s range of truck models, presented in a diverse range of applications and sizes designed to meet the requirements of an equally varied profile of commercial vehicle users. Themed as “Trucks for Life,” the models featured at the show not only demonstrate Isuzu’s heritage in and core competency at truck manufacturing, but also strengthen the company’s ties with consumers. Leading the 19-vehicle lineup at this year’s Truck Fest are Isuzu’s heavy-duty models, which have long served as benchmarks both globally and locally for their quality, durability and reliability. Boosting this reputation are Isuzu’s leadership in diesel technology, the wide availability of parts to support the vehicles’ operation for numerous years, and the competent service provided by a large network of dealerships. At the 2016 Truck Fest, taking the spotlight are Isuzu’s C-Series and E-Series models, most prominent among which are the CYH51S (GVW 41 tons) , a 20-cubic-meter dump truck, and the similarly configured CYZ51M (GVW 33 tons), a 15-cubic-meter version. Another CYZ51M, equipped with a control lever and is designed as a concrete mixer, complete the full-size C-Series range. The heaviest sized E-Series models are represented by two examples of the EXR51F (GCM 45 tons), and an EXZ51K (GCM 60 tons). Displayed as tractor heads, the trucks are readily configurable to serve a variety of purposes. For their part, the EXR51F flatbed and the two EXZ51K fuel tankers can immediately be deployed for their respective duties. 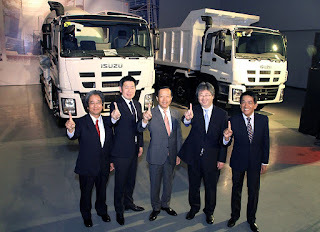 Along with the heavy-duty models, also showcased are Isuzu’s light-duty N-Series trucks, which have been the Philippines’ best-selling light-duty commercial vehicles for more than 15 consecutive years. Lined up at the event are the NPR85 and NPS models, which come in cab and chassis format so these can be designed for different applications. Exhibited as purpose-built models are the NHR NT flexi truck, NHR MB i-Van, NQR dropside, and an NQR aluminum van with a side door. For the medium-duty category, an F-Series FRR aluminum van, also equipped with a door on the side, is also featured. Adding even more diversity to the show are two special vehicle bodies imported from Thailand, one of which is mounted on an FVM truck. The other body has an interior where the temperature can be controlled. Meanwhile, IPC provided their guests relevant information on the benefits of purchasing brand-new trucks, and outlined the risks involved in choosing used ones. The company also treated on-site customers to P 10,000 worth of fuel cards, P 10,000 worth of LTO registration services, and P 10,000 worth of parts coupons. According to Koso, both activities are meant to show IPC’s gratitude toward Filipino consumers. “There is nothing more valuable than the trust that our customers have put into our hands, and for this reason, we are continuously working hard to provide excellent products and services best suited to the demands of the Filipino market,” Koso said. Sinotruck, Chenglong at Foton ang mga bagong trucks dito sa Pampanga. Sana dumami rin ang Isuzu. sir kumusta nmn performance ng Foton brand na truck? any major issues na dapat i-consider b4 buying this brand? salamat!